Spices and herbs are the secrets to adding flavor and depth to your cooking. The best spice rack can be your flavor ally. Not only do spice racks put ingredients at your fingertips, but they also help organize your kitchen and keep the ingredients fresh. Expired kitchen spices are a common problem for many households. Someone shares an exciting recipe with you, and you hit the market to buy the ingredients, only to find yourself wondering if you still have that small jar of cloves or garlic powder. When you get home, you frantically search your disorganized cabinet. Some bottles are standing upright. Others — usually the small, squat ones with pumpkin pie blends — have rolled to the back of the cabinet. The best spice rack solves two problems. First, it gives you a flavor toolkit. Then, the rack keeps your spices under control. Spices hold an essential role in culinary history. As flavor enhancers, spices and herbs help expand early human diets. Spices are critical to many preservation techniques, such as smoking and curing, and can mask less than desirable flavors in certain foods that are dried or aged. Today, preservation is less of a concern in most countries, but we've become accustomed to spice flavors. For the most part, spices add character and taste to foods without increasing calories, fat or cholesterol. A dish with well-balanced spices can have less fat while retaining a delicious taste. Also, people today are more adventurous with their dining choices. We live in a global world, where access to information spreads exotic recipes with ease. Today, spices such as smoked paprika, za'atar, Chinese five spice blend, and garam masala are just as likely to be in a recipe as black pepper and garlic. The increased variety and popularity of spices can result in an overloaded kitchen cabinet. Spices often come in small, non-uniform bottles that can rattle around in a cabinet, where they get lost among other ingredients. One of the best ways to address spice storage issues is by using a spice rack. The best spice rack keeps flavors close at hand, and ready for use in any recipe. A significant problem relating to spice storage is shelf life. While many spices can help preserve flavors, they lose potency and quality within two to three years after opening. Three years may seem like a long time, but if you've been living at your home for long, you might have a tiny jar of ground mustard or celery salt from the last decade hiding in a cupboard. Old spices aren't necessarily going to make you sick, but they won't taste as good as the fresh stuff. The best spice rack keeps your spice supply visible. With a spice rack, you are more likely to know what you have and which spices you need. Not to mention, having them in your line of sight may help you remember to experiment more with your flavors. A good spice rack is all about organization. Spices can be alphabetized, or arranged based on use or cuisine. If you like adding a cajun zip to your meals, you might prominently feature a jar of cayenne or your favorite blackening rub, for example. Many spice racks come with uniform containers that you label and fill, while others accommodate popular spice jar shapes. Some spice racks aren't racks at all but are magnetic systems to suspend small metal jars on your refrigerator or a metal panel in your cupboard or pantry. Other racks come pre-loaded with a variety of spices, so you don't have to stock the rack yourself. Another spice rack concern is how the contraptions look in one's kitchen. Whether your design aesthetic is sleekly modern or country chic, spice racks can be an eyesore. The best spice rack either blends in with your style or stays out of view. Those magnetic metal jars fit in with an industrial looking kitchen or alongside stainless-steel appliances. For a rustic kitchen, a rack made of beautiful polished wood might be just the thing to complete your look. While individual spice rack needs may vary considerably, there are many excellent choices for today's consumer. In determining the best spice rack, we wanted to feature a broad range of styles and options, then pick the best overall. In addition to selecting several top choices, we focused on customer comments on everything from ease of use to build quality in determining the best spice rack. Since we are not comparing apples to apples, we felt it crucial to find a spice rack that is not only functional but affordable, durable and convenient as well. Our 10 highlighted spice racks range from simple wall-mounted models to fully-pre-stocked premium wooden racks. We note the features and benefits of each, price ranges and survey specific customer reviews. Here are the top 10 spice racks available today, in no particular order. Kamenstein makes several different spice racks, but most are small countertop models. The Kamenstein 16 jar model is simple, compact and easy to navigate. Instead of scanning through a long line of spices in a linear rack, this model spins like a lazy susan. Best of all, this rack comes fully-loaded with 16 popular spices, dried herbs, and spice blends. These include marjoram, basil, celery salt, crushed mint, parsley, chives, sea salt, bay leaves, coriander, fennel, herbes de Provence, rosemary, pizza seasoning, Italian seasoning, oregano, and seasoned salt. Not only does the Kamenstein come with these spices, but it also provides refills for five years after purchase. Prices for the Kamenstein range from $$ to $$. 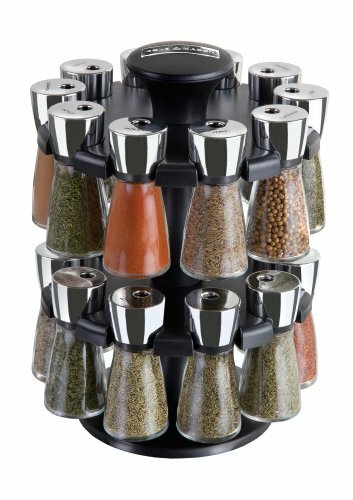 Customers love this spice rack. Some note that the rack design is easy to use, and would be a great value even if the kit did not include a bounty of spice and free refills. Some, however, criticized the lack of certain staple spices, such as garlic powder and cinnamon. 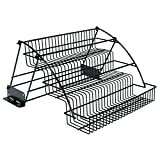 Prices for the Rubbermaid rack range from $$ to $$. Customers enjoyed the stadium-seating display for spices. Users indicate that the rack holds 21 McCormick glass spice jars — which are some of the most common. Some negative comments noted that mounting instructions were difficult to understand and that if mounted incorrectly, the rack system does not work well. For a spice rack that is fit for display in any home, the AllSpice 30 jar wooden spice rack is a pricey, but beautiful product. It is available in seven different wood finishes and holds Penzey's Spice-sized jars, which is another popular spice manufacturer. The kit comes with 30 large glass jars, but these are empty vessels. You also receive pre-printed labels that cover almost every spice imaginable. 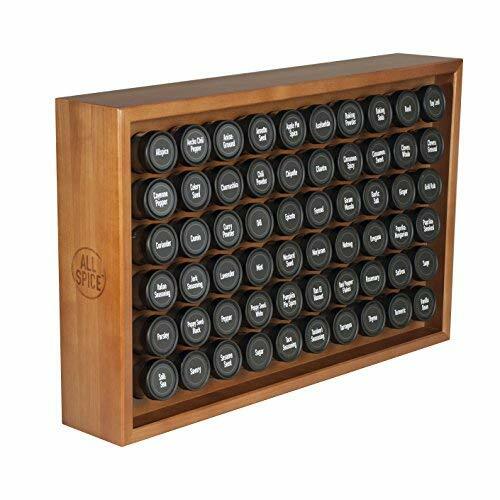 The price range for the AllSpice rack is from $$$ to $$$. With over 325 reviews that are unanimously positive, the AllSpice rack is one of the best-rated spice racks on the market today. Customers love the design and numerous label and jar options, including shaker tops and ones for fine powders like cinnamon and nutmeg. Similar to the AllSpice 30, the 60 jar rack is for those culinary enthusiasts who toss spices into everything they cook. This rack looks great on the wall or sitting on the counter. Its sturdy wood construction ensures that the rack won't tip over. Just like the 30 jar model, this features high-quality glass jars with countless pre-made labels and options. Price for this larger model ranges from $$$ to $$$. Customers noted the sturdy build and jar quality. There were no negative comments of note. 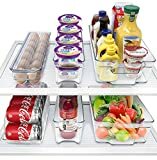 As a practical matter, this model may be overkill for many home cooks, but in general, it is a great product that will last for years. Another Kamenstein product features a similar variety of spices, with the same five-year refill policy, but with different shaped jars. These bulb-like jars add an attractive, unique look to your kitchen. 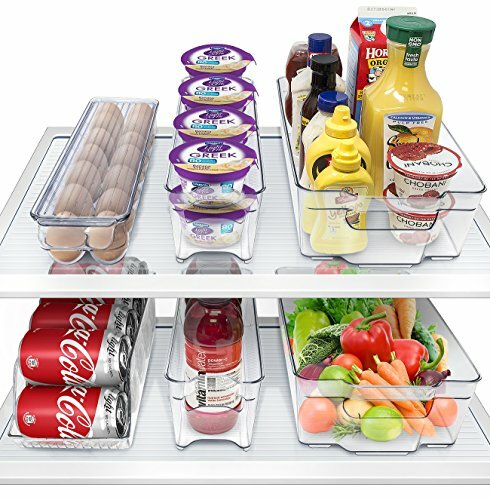 With a two-tiered storage system, jars are easy to reach when needed. The rack is small, too, and features a convenient carrying handle. So, if you prefer keeping your spices out of sight, you can easily take them out for cooking. 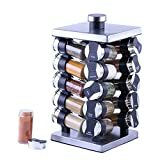 Prices for this spice rack ranges from $$ to $$. 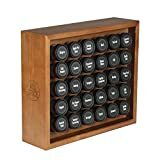 Like the other Kamenstein rack on this list, customers highly rate this as a contender for the best spice rack available. 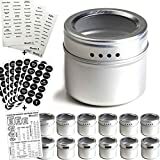 It is convenient and easy to use, but some noted the lack of quality in the plastic jar tops. Another commenter shed some light on the free refills, noting that shipping and handling charges apply and can add up quickly for a full refill of all spices. Another popular revolving countertop spice rack is the Cole & Mason 20 jar. It is a stunning product that combines a pro-kitchen look with intuitive design. The glass bottles have chrome tops with etched-in spice and herb names. These tops twist for either shaking or pouring depending on your culinary needs. Prefilled spices include basil, bay leaves, caraway seeds, celery seeds, chili flakes, ground cinnamon, coriander seed, ground cumin, dried dill, fennel seed, Italian blend, marjoram, dried mint, whole mustard seed, dried oregano, paprika, dried parsley, rosemary, savory and thyme. Price ranges from $$ to $$. Most customer reviews of this best spice rack noted the stylish looks and quality build. Negative comments noted the chrome is not metal, but chrome-plated plastic. Buyer beware, then, as the manufacturer's description seems to indicate that the tops are metal. 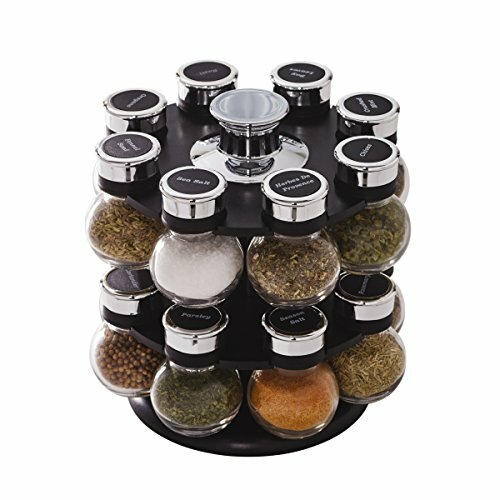 One of the most exciting and unique kitchen products around, the Gneiss Spice rack is gorgeous and innovative. These cute glass jars with magnetic metal lids look like glass tile or a clear honeycomb when stacked together. The company's tagline is: "Have a fridge? Then you have a spice rack." Rather than fool with finding space for a rack in your cabinets, keep all of your spices in one spot on your fridge. As a bonus, these can hold up your children's soccer pictures, too. While the jars are cool, and you can mix and match 1.75-ounce sizes with 4-ounce sizes, they do not come pre-filled. 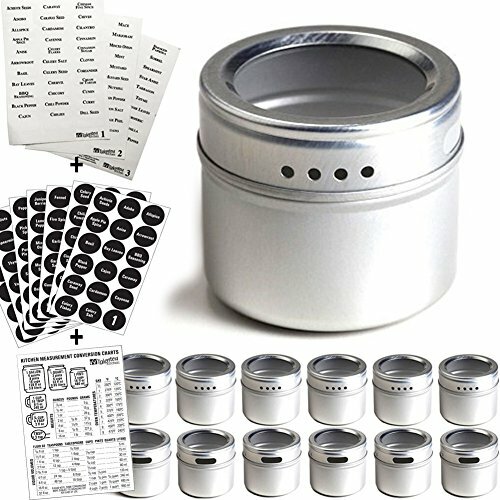 Prices range from $$ to $$$ depending on the number and size of the jars. Customers rave over the unique design, and there are few negative reports. It's one of the few spice rack products where customer service ranks as being superior. Some pointed out that the smaller jars are too small, not holding the contents of most store-bought spices. Another, more traditional but still modern approach to the best spice rack solution is using small magnetic metal tins. The tins sold by Talented Kitchen have clear lids and a labeling system featuring 96 of the most common spice names and the ability to add custom labels. Fill the jars and stick them to your stove, refrigerator or backyard grill. This spice rack is also good for other uses, such as organizing arts and craft supplies. Prices range from $$ to $$. There are a lot of customer comments on this product. Most of the user reviews for this product are positive. Many call this one of the best kitchen hacks ever, noting how you can line the inside doors of your cabinets with metal plates, then apply the jars. The few negative reviews noted that the jars could be difficult to clean. Sometimes the best spice rack screams modern design and begs to sit on display. The Orii Rotunda fits 20 jars into a unique look that combines glass, metal, and black plastic. These jars are prefilled with all the spices a home chef needs, and best of all, the contents are easy to see even without looking at labels. This visibility comes from how the jar fit sideways into the rack. Prices for this spice rack range from $$ to $$. Again, this rack has several fans, especially those who enjoy modern design. It is an elegant spice rack, and customers also liked how the jars featured simple pouring or shaking options. Spice racks don't get much more simple than the Sorbus Organizer. This four tier rack differs greatly from the popular modern-styled racks. Instead of sleek metal and glass, this rack features chicken wire for a rustic country look. It fits all your favorite spice brand bottles, holding between 20 and 24, depending on their width. Since it is slim, you can easily mount this rack to the inside of a cabinet or pantry door to save space and keep your ingredients handy. 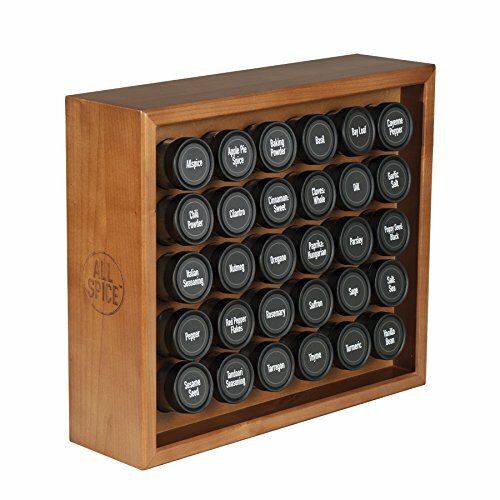 The Sorbus Organizer is just a rack; you supply the bottles, jars, and spices. Prices for this rack range from $$ to $$. Although this is a no-frills spice storage solution, customers like its simplicity. It does its intended job perfectly — it keeps spice jars in line and organized. Some noted that taller jars might not fit. Others said the chicken wire construction could feel bouncy and less sturdy. The best-reviewed rack is the AllSpice collection of wood racks. 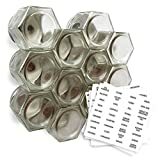 These are sturdy, easy to use and look great in any kitchen. They may be pricey, but you won't be tossing out chipped jar lids or complaining about flaked plastic "chrome." Though, 60 jars is a bit overkill for most home cooks. We recommend the 30-jar AllSpice model as a permanent addition to your kitchen.